You are here: Home > News > ‘Massive Monolith’ threatens to overshadow some of Belfast’s best historic architecture. 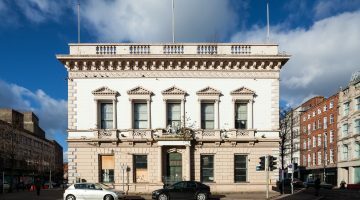 In October 2017 and January 2018, Ulster Architectural Heritage objected to applications relating to the ‘City Centre Regeneration’ formerly Royal Exchange. These objections set out the organisation’s concerns regarding the detrimental impact of proposed development on the fabric and setting of listed buildings, and the City Centre Conservation Area in and around Rosemary Street. These objections still firmly apply. On Tuesday 13th February UAH presented to the Planning Committee at Belfast City Council at a predetermination meeting for the application relating to the area of Rosemary Street, one of 25 applications pertaining to the overall development plan. Also speaking in opposition alongside UAH were representatives of campaign group Save CQ and the congregation of Rosemary Street Presbyterian Church. UAH highlighted the advice of statutory consultee, the Historic Environment Division, (HED) who, in their response dated 27th November 2017 detailed their opinion that the application is contrary to policy PPS6 and SPPS. This is particularly, but not exclusively, with regard to the Masonic Halls, Rosemary Street Presbyterian Church, and the effect of this application on the setting of listed buildings. UAH fully support the HED analysis of these proposals, to date, but it appears that this detailed statutory advice has been ignored. Proposed ‘Block 6’, directly behind Rosemary Street Presbyterian Church, is shown on the drawings as being 30m high, approx. 10m higher than previously permitted and is closer to the listed Rosemary Street Presbyterian Church, rendering the extant permissions of little relevance to the consideration of the new plans. HED, describe block 6 as ‘monolithic’, ‘massive’ and ‘undifferentiated’, and confirm that the new development failed to satisfy policy for protection of listed buildings. In addition there appears to be no application for listed building consent for development affecting the setting of Rosemary Street Presbyterian Church. HED’s note of failure to comply with established policy indicates a requirement for listed building consent. Although it is unfortunate that HED did not specifically highlight this omission, it is our firm view that this application should not proceed without this additional listed building consent. UAH highlighted that HED are no longer statutorily required to comment on the impact of this application on the conservation area. As of April 2015, responsibility for conservation area protection lies solely with Belfast City Council. UAH is not aware of any BCC conservation officer’s report being on public record. This is unacceptable and falls far short of the Council’s duty of care for our irreplaceable built heritage. UAH highlighted that analysis of effect of this application on the conservation area, totalling 3 short paragraphs on page 30 of the Development Officer’s report, together with the officer’s unsubstantiated conclusion suggesting the benefit of the application to the conservation area, is woefully inadequate. It is acknowledged that this is a major planning application; UAH would have expected it to be assessed by the Department for Infrastructure. UAH believes that the engineered complexity of 11 applications in this phase, and 25 for the overall scheme – phased one minute, fully extant the next, full, in advance of outline, with listed building consent and without listed building content and with individual permissions appearing to lever the whole- renders overall consideration of the application beyond the capacity of any member of the public or any council planning committee, in Northern Ireland. YOU CAN STILL RESPOND: Application Reference: LA04/2017/2126/F. Full details can be found here. Email response can be sent to [email protected]. Other relevant applications include: LA04/2017/2341/O, Outline for overall ‘City Centre Regeneration’. Also Masonic Hall, 15 Rosemary Street, BT1 1QA- LA04/2017/2082/LBC and LA04/2017/1448/LBC; Rosemary Street Presbyterian Church- LA04/2017/2081/LBC; and Central Hall, 37-39 Rosemary Street- LA04/2017/2120/LBC and LA04/2017/2196/DCA.